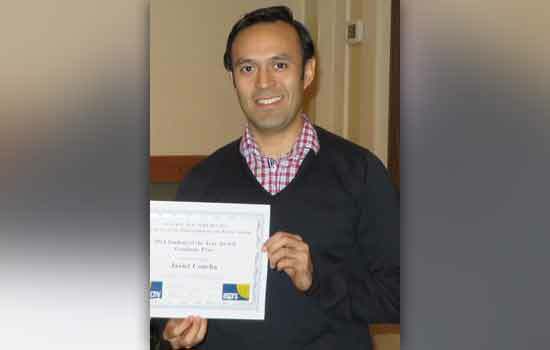 Rochester Institute of Technology graduate student Javier Concha was named Student of the Year by the Central New York Region of the American Society for Photogrammetry and Remote Sensing. The society selected Concha, a Ph.D. student in RIT’s Chester F. Carlson Center for Imaging Science, from applicants in upstate New York, Vermont and north central Pennsylvania. He was awarded a one-year society membership, a certificate and $250 at the annual meeting in Rochester on April 15. Javier Concha was named Student of the Year by the Central New York Region of the American Society for Photogrammetry and Remote Sensing. Concha is also a member of RIT’s SPIE/OSA Student Chapter and will serve as its secretary next year. Concha, originally from Concepción, Chile, came to RIT on a Fulbright scholarship to work on his master’s degree in the Center for Imaging Science. He earned his MS in 2012 and expects to finish his Ph.D. in spring 2015. His thesis research explores the use of NASA’s Landsat 8 Earth-imaging satellite for monitoring fresh and coastal waters. Concha works closely with his adviser, RIT research professor John Schott, whose history with the Landsat program dates to the mid 1980s. Three SPIE Fellows and four SPIE Members were recently awarded the Robert H. Goddard Award for Science for their participation on the Landsat 8 Calibration/Validation Team (CVT), which contributed to the characterization, calibration, and performance understanding of the Landsat 8 sensors. 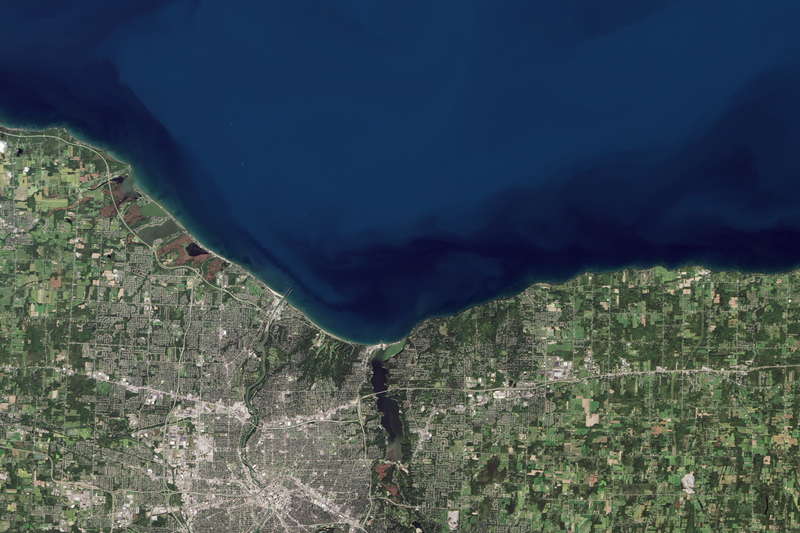 Since 1972, Landsat satellites have been amassing information about Earth's land cover to better understand big issues like water use, carbon stocks, and global crop production. The Landsat Calibration/Validation Team ensures that Landsat data users can be confident that measurements made day-to-day, year-to-year, and Landsat sensor-to-sensor are comparable. The team, managed by Brian Markham, a longtime Landsat calibration scientist at Goddard, included 52 scientists from Goddard, the U.S. Geological Survey, Ball Aerospace & Technology Corp., South Dakota State University, Rochester Institute of Technology, University of Arizona, and the Jet Propulsion Lab. Medical-imaging software under development at Rochester Institute of Technology could someday give radiologists a tool for measuring the growth of nodules in patients at risk of lung cancer, the leading cause of cancer deaths in the United States, according to the Center for Disease Control and Prevention. 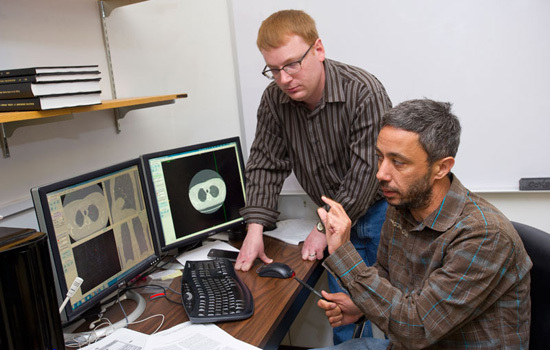 Nathan Cahill, an associate professor in RIT’s School of Mathematical Sciences, is creating algorithms to quantify the growth of lung nodules imaged on Computed Tomography (CT) scans. The two-year, longitudinal study, funded by the National Institutes of Health, compares existing scans of individual patients. The algorithms will analyze medical images, measuring changes in nodules to identify small cancers or, if stable, obviate unnecessary, often risky biopsies. Simple factors can complicate the comparison of CT scans, creating extraneous information in medical images, introducing artifacts and possible errors in diagnosis. “It’s not an apples-to-apples problem with reliable correspondence between two images,” Cahill said. Discrepancies between scans of a single patient can result from differences in position and inhalation during imaging. A 10-pound weight gain between CT scans can also affect how surrounding organs push against the lungs and stretch or compress the nodules. Dr. David Fetzer, a radiologist at the University of Pittsburgh Medical Center and a member of the collaboration, suggested the clinical problem. 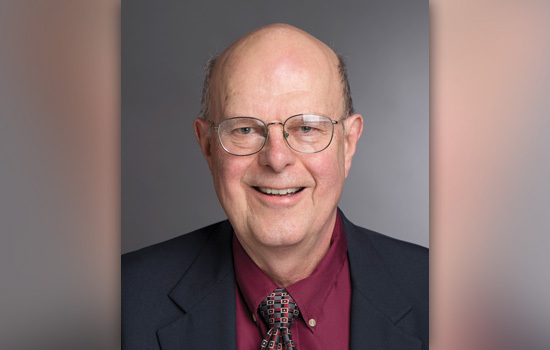 Fetzer, an alumnus from the RIT Chester F. Carlson Center for Imaging Science, had worked as an undergraduate with Maria Helguera, professor in the center, and a member of Cahill’s team. Cahill and Kfir Ben Zikri, a Ph.D. student in the Center for Imaging Science, are registering, or aligning, backgrounds to create a common frame of reference between sets of images. The process geometrically transforms one three-dimensional image into another and compensates for background information that blurs edges of nodules, even when underlying diseases like emphysema or fibrosis make intensities in the background brighter. “Then we can estimate the volumes, which will allow us to more accurately estimate the doubling time and have a better chance to determine if it’s a malignant growth or benign,” Cahill said. The technology will be part of the free software libraries offered by Kitware, a North Carolina-based, open-source software company that specializes in medical image analyses. Cahill and Ben Zikri work closely with scientists at Kitware and professor Marc Niethammer at the University of North Carolina at Chapel Hill. Fetzer is selecting 30 CT scans of patients treated for lung cancer at the University of Pittsburgh Medical Center. The images are scrubbed of patient-identifying information and sent to Cahill and Ben Zikri. Fetzer will clinically verify the algorithmic results. The Excellence in Faculty Mentoring Award recognizes faculty members who have demonstrated an outstanding commitment to faculty mentoring by actively helping non-tenured faculty in developing their careers. Harvey Rhody, professor of imaging science, Chester F. Carlson Center for Imaging Science in the College of Science, came to RIT in 1970. His research interests include imaging systems, remote sensing, imaging algorithms and image processing. To see a full list of recipients, click the "Read Full Story" link below. My Masters thesis focused on Medical Image Processing and Enhancement, so I was often searching for universities that are reputable in the field of Imaging - which brought me to the Center for Imaging Science at RIT. The multidisciplinary nature of CIS was an interesting feature that I really wanted to experience. Being exposed to different applications, from medical to hyperspectral imaging, from electron microcopy where we are looking for an object of a size of 10 nanometers, to astronomical imaging where we are looking for objects thousands of kilometers big, is an awesome experience! I’m currently working as a graduate research assistant within my research field of interest: Virtual Reality. Using this powerful tool and combining it with motion capture technology plus a built in eye-tracker, we are studying how human perception systems interact with the world. When I came here my upper-class friends used to tell me, “Hey, you’ll meet all the nicest and most helpful people in CIS.” As far as my experience goes, I couldn't agree more; we’re actually a “family” here. By the time she reached midcareer, scientist Jie Qiao knew something was fundamentally wrong with the science-and-technology workforce. She was struck by the dwindling number of her female colleagues presenting at professional conferences or assuming leadership positions. “There are a lot of reasons why women drop out of science,” said Qiao, an associate professor in RIT’s Chester F. Carlson Center for Imaging Science. Many women feel isolated, lonely and taxed by competing demands of work and home, she noted. Others feel in need of mentorship, out of the loop, excluded from informal decision-making opportunities and disliked for their successes. Qiao knows the scenarios firsthand as a woman in the male-dominated field of optics and photonics. She established her career developing technology for photonics, optical instrumentation and laser systems in laboratories in the corporate and academic sectors. Outside of the laboratory, Qiao has a growing reputation as the founder and chairperson of an organization that brings together women in science, technology, engineering and entrepreneurship called WiSTEE Connect. Qiao launched the networking organization in 2013 at the University of Rochester and brought it to RIT later that year. The group has quickly grown into a regional organization. The response to the professional networking events Qiao has organized in China, UR, RIT and at an Optical Society of America conference confirms her belief that junior faculty and mid-career women need more support. Entrepreneurship is another key aspect of WiSTEE Connect. WiSTEE Connect is a multidisciplinary and cross-ranking platform for providing an environment to foster a “mentorship ecosystem” and collaboration in the spirit of “cooperative advancement,” she said. Qiao envisions it growing into a national organization for women to share experiences, knowledge and strategies for mentoring, collaborating and navigating their careers as well as for overcoming unspoken stereotypical expectations. For more information about WiSTEE Connect, go to www.wisteeconnect.org. 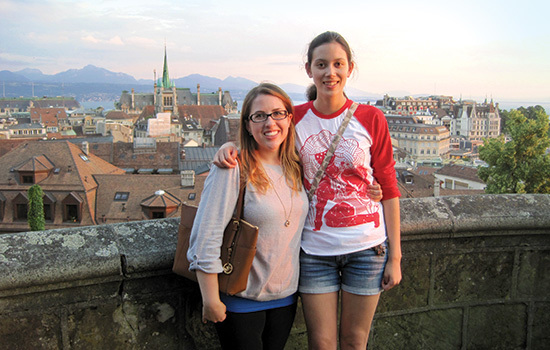 (Nathan Cahill) RIT students Amanda Ziemann, left, and Selene Chew attended a conference in Lausanne, Switzerland, and connected with seasoned industry professionals. Jie Qiao had RIT students like Amanda Ziemann and Selene Chew in mind when she founded Women in Science, Technology, Engineering and Entrepreneurship Connect. The professional networking organization provides concrete support, mentorship and collaboration for students and young women on the cusp of their professional lives and through the rest of their careers. 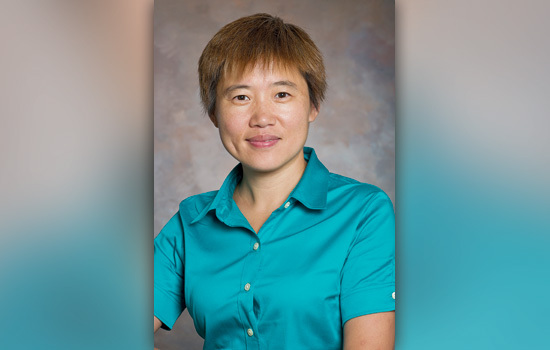 It bridges women at the junior and middle levels with those in leadership roles, said Qiao, an associate professor in RIT’s Chester F. Carlson Center for Imaging Science. Ziemann and Chew gained professional perspective, opportunity and visibility—goals central to WiSTEE Connect—while attending the Workshop on Hyperspectral Image and Signal Processing: Evolution in Remote Sensing in June with their mentors, RIT professors David Messinger and Nathan Cahill, respectively. Ziemann, a Ph.D. student in the Center for Imaging Science, presented a paper and co-chaired her first session, while Chew, a third-year computational mathematics major and honors student, gave a poster presentation at her first international conference. 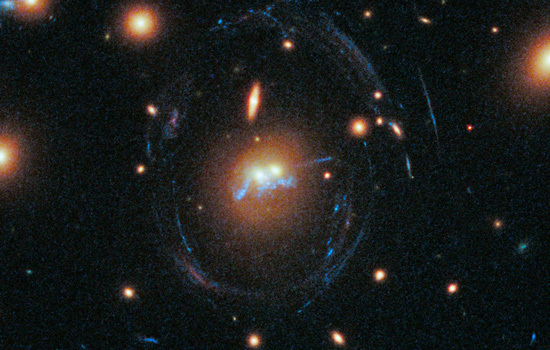 (NASA, ESA and RIT) The NASA/ESA Hubble Space Telescope captured a cosmic moment of two merging cluster galaxies connected by a bright blue string of young stars. Stars forming like a string of blue pearls along two elliptical galaxies could be the result of a galactic merger, according to an international team of astronomers. The structure could reveal rare insights about elliptical galaxies. Scientists from Rochester Institute of Technology helped analyze data from the Hubble Space Telescope showing elliptical galaxies coalescing at the core of a dense galaxy cluster. The study is part of a program sponsored by the Hubble Space Telescope—an international cooperation between NASA and the European Space Agency—to look inside 23 massive clusters first catalogued in the Sloan Digital Sky Survey. Findings of the study, “A thirty-kiloparsec chain of ‘beads-on-a-string’ star formation between two merging early type galaxies in the core of a strong-lensing galaxy cluster,” are available online, at http://arxiv.org/abs/1407.2251 and in an upcoming issue of The Astrophysical Journal Letters. O’Dea and co-author Stefi Baum, professor and director of RIT’s Chester F. Carlson Center for Imaging Science, were thesis advisers and mentors of the paper’s lead author, Grant Tremblay, a post-doctoral fellow at the European Southern Observatory in Garching, Germany, and an inaugural alumnus of RIT’s astrophysical sciences and technology Ph.D. program. 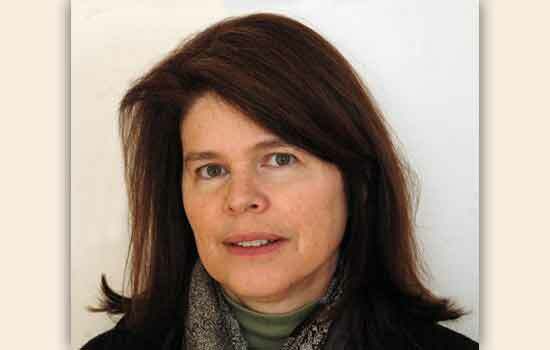 Tremblay will join Yale University as a NASA Einstein Fellow in September. 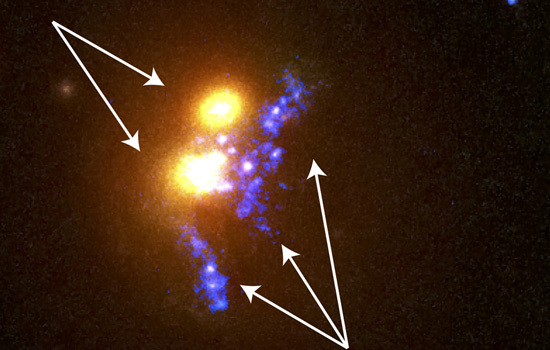 (NASA, ESA and RIT) A zoom-in shows the two merging central cluster galaxies in yellow/orange and the “beads-on-a-string” star formation in bright blue. The 100,000-light-year-long structure identified in the Hubble data is dotted with 19 young, blue star clusters like pearls on a string, evenly spaced and separated by 3,000 light-years. The star necklace will lose its shape in about 10 million years as each of the 19 stellar superclusters follows a different orbit, Tremblay said. Earlier observations of star clusters forming in evenly distributed clumps in spiral galaxies could explain Tremblay’s “serendipitous discovery” in the Hubble data. Collision—A galactic collision created an X-ray shock catalyzing the star formation by compressing the gas and cooling the plasma. Tremblay’s team has a strong connection to his alma mater, RIT, with three co-authors from the university—Baum, O’Dea and Cooke. In addition to the RIT contingent, the team of scientists includes Michael Gladders, University of Chicago; Matthew Bayliss, Harvard University and Harvard-Smithsonian Center for Astrophysics; Håkon Dahle, University of Oslo; Timothy Davis, European Southern Observatory; Michael Florian, University of Chicago; Jane Rigby, NASA Goddard Space Flight Center; Keren Sharon, University of Michigan; Emmaris Soto, the Catholic University of America; and Eva Wuyts, Max-Planck-Institut für extraterrestrische Physik.